It's time to get down and dirty as Industrial Strength invades your DAW with a new arsenal of the hottest Dubstep sounds on the planet produced by non-other than LA's 6Blocc. 6Blocc brings an exclusive set of sounds, one shots and loops from his personal collection all in one banging license free sample pack. Dubstep Ammo features over 450 samples and contains 439 mb of pure banging Dubstep just the way you like it. This man is known to many in the world of DnB as R.A.W. or B-Boy 3000. His reputation behind the decks is unmatched with lightning fast scratching and seamless mixing. As a producer and remixer he is leading the American Dubstep scene like no other. 6Blocc got his start way back in the late 80’s mixing Hip Hop and Electro in his home town of Los Angeles. By the early 90’s he moved into Jungle and took the U.S. by storm. Since then, he has touched down in Japan, Australia, Canada, Russia, Europe, Israel, Mexico, Venezuela and every major city in the USA delivering booming bass and booty shaking drum beats to countless crowds. When 6Blocc isn't wrecking the turntables he's in the studio cranking out the most insane Dubstep productions and remixes. Currently he is working with Cypress Hill producer DJ Muggs on a Hip Hop / Dubstep project and soon with San Fran’s Bassnectar! 6Blocc has also knocked out remixes for artists such as Lutan Fyah, Chuck Fender and Lexxus, Dub FX, Dstar, Unbalanced Jack, Don Goliath, Roommate, Jaybird, Bombaman, Deformer, Matt Green and Nortec Collective. His smoking hot record label 6DUB is an outlet for his hottest dub plates thru a series he calls I Dubs (illegal dubs!) featuring Dubstep remixes of Fugees, Dr Dre, Method Man and Redman, Bone Thugz n Harmony. 6Blocc is also featured on Lo Dubs,Terminal Dusk, Moonshine and has an upcoming full length LP on Foul Play Records. There is no stopping this man as his passion for bass culture music is evident in his production work and DJing. This bad boy sample pack features Acid wav, Apple Loops and Rex.2 for drop and rock performance on all the loops provided in the pack. Each sample is Keyed and clearly labeled for ease of use. All the samples are recorded at 24 bit / 44.1khz to give you the best quality samples for your productions or remixes. Dubstep Ammo features a wicked selection of one shots all in Battery3, Logic Esx and of course Ni's Maschine. This highly usable pack also features 29 whopping Kontakt kits with the all best sounds from the pack at your fingertips. The pack is jammed with wobble bass sounds, booming effects bombs, grinding synth loops and of course rumbling sub bass sounds to shake n bake your DAW like no other Dubstep pack on the market. It does not stop there. The pack is loaded with a selection of Tearout bass patterns, bass drills, stabs and a slew of effect sweeps, atmospheric sounds and some of his personal Skank Synth loops to get your party started right. 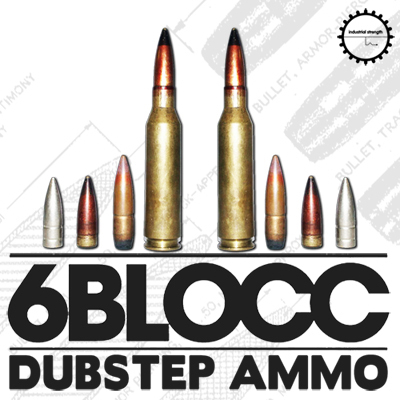 Dubstep Ammo also features vocal samples from L.A.’s Dubstep lyricist Mc Woes to give you everything you need to get that true 6Blocc sound in your DAW. If you’re looking for a Dubstep sample pack that can deliver top notch sounds with L.A. attitude from one of the best producers in the business then get ready to lock and load Dubstep Ammo into your next production or remix.